Do this with a partner; it is way too complicated and time consuming to do on your own. Choose a park near your residence! Organize your information into 3 folders: Monarch Waystation, Grant, Adopt a Park. Get in touch with your city councilor for necessary contacts. Also, obtain a formal letter of support for the project from your councilor. Meet on site with a project manager from the city‘s Parks and Recreation Department to discuss the project. He/she will give you tips on informing the neighbours, seeking approval, and canvassing for help. Engaging the immediate neighbours gives them ownership in the park. Drop off a letter explaining your initiative first and then make personal contact. 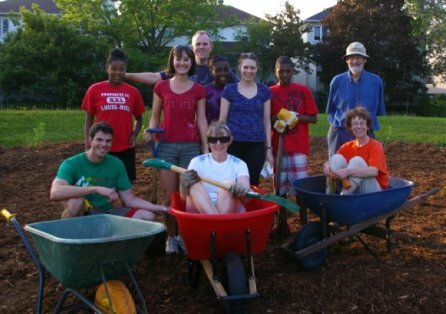 We are presently in the process of applying for grants to construct a garden, specifically a Monarch Waystation Garden in _____ Park. We wanted to inform you, as a neighbouring home, of our interest in case there is a particular concern or you wish to assist with our endeavour. We saw this as a very suitable location with ideal sunlight, a shady bench on which to sit and enjoy the garden, well visited by young and old alike. There is also the potential for classes from _____ School to use the garden for curriculum purposes. When neighbours have ownership in a project, it is more likely to succeed. Both of us are retired teachers, and very much involved in the Monarch Teacher Network (MTN) – Canada. As teachers, we integrated Monarchs: their life cycle, migration to Mexico, and numerous other related topics into our classroom curriculum each September. Now these magnificent insects are in declining numbers, and it is more important than ever to bring public awareness to them. Over the past 6 years, we have hosted 4 workshops here in Orleans, training teachers across the province and in Quebec in using the Monarch in their classrooms. Recently funds have been made available to MTN from the TD Friends of the Environment Foundation to establish gardens to attract and nurture Monarch butterflies, their eggs, caterpillars, and chrysalises… more specifically with waystation status. This means the garden is developed with strict guidelines from Monarch Watch to satisfy the requirements of Monarchs during their life cycle and while on their migratory flight. We will apply for funds from a city source to supplement the initial grant. Signs would be erected from both Monarch Watch and TD. The garden must contain only native plants (both host and nectar varieties), that we plan to plant, monitor, and maintain ourselves; however, any volunteer help from gardening enthusiasts would be welcomed. At present, our biggest obstacle is finding a consistent water source, but we have a few ideas and are working with our local councillor and city officials, so hope to find an easy solution. Preparation and planting would take place in late spring, but applications for grants must be done ASAP. Please let us know if you have a particular concern, an idea, or wish to assist in any way. Thank you. A few months later we were asked to get letters of support from other neighbours NOT touching the site. 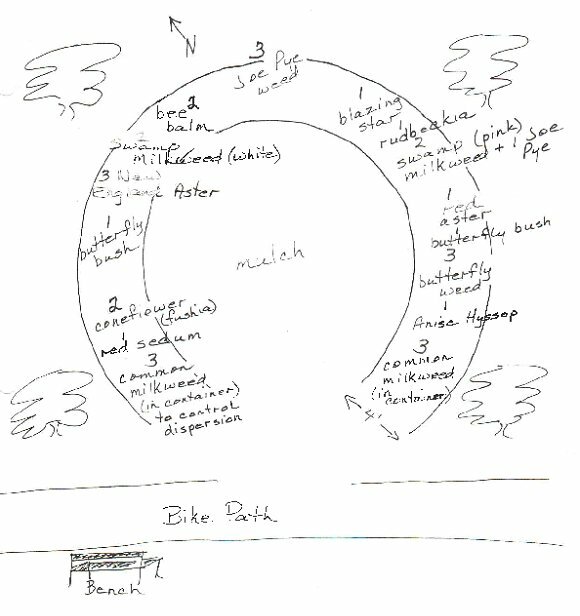 We left a notice in mailboxes and obtained these notes by email. My colleague and I have been successful in obtaining grants to construct a Monarch Waystation Garden in nearby _____ Park. We saw this as a very suitable location with ideal sunlight, a shady bench on which to sit and enjoy the garden, well visited by young and old alike. There is also the potential for classes from _____ School to use the garden for curriculum purposes. The garden will be developed following strict guidelines from Monarch Watch (a nonprofit education, conservation and research program) that satisfy the needs of Monarch butterflies during their life cycle and while on their migratory flight (native plants, both host and nectar varieties). We plan to plant, monitor and maintain it ourselves (but volunteers are always welcome). Upon garden completion, signs will be erected from Monarch Watch, TD Friends of the Environment, and the City of Ottawa. * A simple sentence affirming your support of this project (e.g., I support this Monarch Waystation Garden in ____ Park, as I believe it will add a new, interesting, and informative dimension to our area). I hope to submit these support messages by January 18, 2013. We were also asked by the City to post a sign for a few months showing the plan and our contact info at the site to inform any passers by. 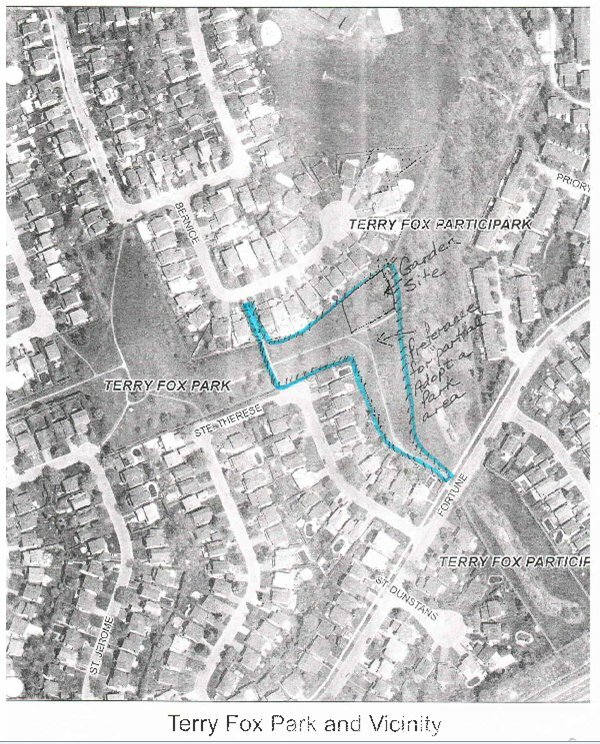 A garden site plan, including a maintenance plan, was required by the City. Common Milkweed was to be planted in containers to control spread. Other plants had to be specified. Any additional plants added, must NOT be invasive. Weed killer made from vinegar, water, and dish detergent was allowed. The site in relation to the rest of the park was required as well. Our councilor supplied us with an aerial view of the park, on which to draw our site. There was a concern over off-leash dogs running through garden and whether a fence was needed. Applying mulch eliminated this concern. A formal letter of support from the Councilor was requested and submitted to the City. The City requested a primary and alternate contact. My colleague and I met with our councilor, City of Ottawa, for assistance and suggestions. He suggested applying for a Community Partnership Minor Capital Project Grant (deadlines May 1 and Sept 1). We eventually declined as there was not enough money available. A source of water is a MUST. City prefers NO rain barrels on site for liability reasons, and would NOT be responsible for providing water. If rain barrels were necessary on site, they must have childproof tops. Locating the rain barrel at a nearby residence is perfect. City agreed to GIVE us a rain barrel. I write to you again with an update on our Monarch Butterfly Waystation Garden. Grants have been obtained, but I still await a License of Ownership from the City to begin work. The process is much more tedious than expected. The license depends partly on the necessary liability insurance. On this note, the location of the water barrel is a concern to me: if it is on City property, it must have a childproof lid, and there is the possibility of it being stolen. If I could find a neighbour willing to locate it in his/her backyard close to the gate in the fence, these concerns would be eliminated. If you would be willing to “house” the barrel in your yard, could you email me or call me please? You may possibly be interested in placing it under your downspout thus eliminating the need to transfer water from my place to the barrel. I have purposely chosen to communicate with you as your gate is very close to the garden site. Thank you and hope to hear from you soon. City prefers compost to fertilizer, and offered to SELL it to us. A bench is NOT allowed for liability/safety reasons. Checked out possibility of getting mulch from City but this didn’t work. A local tree remover has graciously offered to give us mulch when needed. Any sign installed on site must adhere to City standards. There was confusion about the number of signs needed. There would be a bilingual Monarch Waystation sign (or 2 separate signs), showing the City and TD Bank logos. Dimensions and material had to be submitted. Best to get City to install. City will provide the T-bar. Oct 30 we submit application for the CEPGP grant. It is necessary to set up a community account at a local bank to receive the grant money, and to sign an agreement for acceptance of funds from the City. Also we had to prove that we were non-profit. A letter from (MTN) sufficed. Grant acceptance came through Dec. 20, but we still did NOT have permission to use the land! Although not specified, we were allowed to use grant money to purchase Monarchs for the official opening. 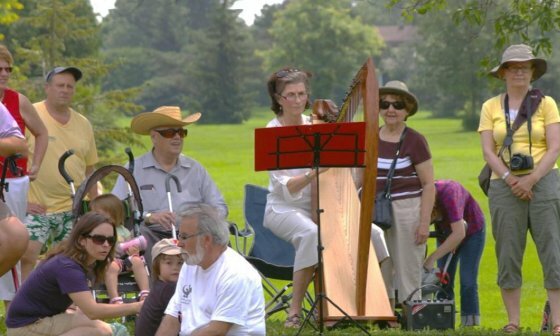 Involve your local neighbours in the process: you need a photographer to document everything, a computer whiz to make the photo journal, a rototiller, planters, mulchers, water barrel houser, local newspaper reporters, neighbours to report sightings, have them submit suggestions for garden names; involve them in planning the official opening (we had a local harpist who composed a piece of music and played her harp for the event). Contact your local community association… write an article in their newsletter. Talk it up to everyone. Involve a local nursery and ask for a discount in return for advertising! Delivery of soil and mulch: city park’s supervisor must be notified in advance so he can meet the truck and ensure safety standards are adhered to. Arrangements must be made to avoid wet days that would damage the landscape. Post a sign inviting all to a Soil Party or Mulch Party! We have just received approval for our Monarch Waystation Butterfly Garden in Terry Fox Park nearby!!! Now the fun begins! This Wednesday, May 15, 10 yards of soil will be arriving in the afternoon. If any of you are interested in joining us with your wheelbarrow, shovel, rake or encouragement, any time you can give will be appreciated. If any of you have senior students who require volunteer hours, we would be pleased to accommodate them as well. We plan to have the plants in the ground by Friday May 17 so if you are a gardener and would like to help with that aspect, please let us know. 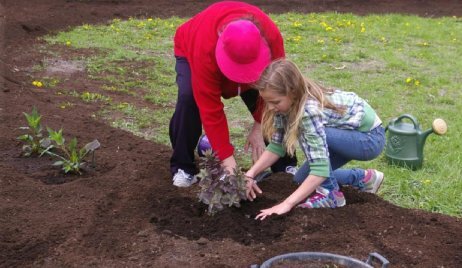 Grade 6 student, Megan, did her part – planting with her neighbour, Anne. They didn’t know each other very well before, but this project brought them together. The garden supports more than butterflies. I’ve included just about anyone who has shown an interest in our butterfly garden as many heads are better than one. Monarch Watch asks that we give our garden a name. I feel the most impressive thing that has appeared from this initiative is how the neighbourhood has come together, so I want to have that the focus of the name. So a name that visualizes neighbours helping neighbours, coming together in/for nature, friendly with each other, meeting each other, handshakes, smiles, Monarchs and other butterflies, cooperative effort, community togetherness, peace and harmony. Send me as many suggestions as you wish. I must make a decision by June 25 but the sooner the better. Thanks for all your creative thinking. P.S. feel free to pass this on to YOUR creative friends. Who: Come join City and local officials, Councillor, special guests, neighbours and friends. Invite your neighbours! Mary Ash is a long-time member of the Monarch Teachers’ Network. She has helped create many Monarch waystations and has personal experience jumping through the hoops of bureaucracy. 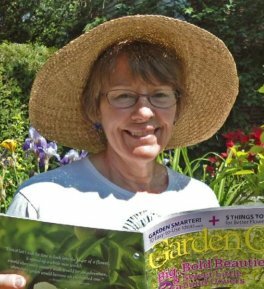 She was closely involved in establishing the waystations we list on our Habitat/Gardens page under MTN. This blog post is based on her own experience.